Welcome to One and Done Sunday. Short and sweet: one picture, and five links that are worth your time. Except I’ll blather on a little first. You may have noticed I’ve been sort of quiet lately. It happens when I get overwhelmed; I imagine a lot of people are like that. I started re-reading a book that I went through probably twelve years ago called One Day My Soul Just Opened Up by Iyanla Vanzant. It’s like a forty-day workbook thing. Something I read in it has been kicking around in my head about slowing down so you can see the truth that’s in front of you (I’m paraphrasing). So I slowed down. No real wisdom to impart from that, except that I feel calmer. I didn’t do much this week except help clear our land from the storm. That was actually sort of a lot, but it was only one day. Three weeks since the storm damaged pretty much every tree in our neighborhood, very little official cleanup has happened. We got a letter from the town about ten days ago (before the election) basically saying, give us a break people, we’re doing our best. But don’t dispose of anything yourself because you can’t be trusted. We did see one truck come to pick up the branches on our street this week. They completely skipped our house. So CC rented a woodchipper and on Friday, CC, #1 and I hit it. I have to say it was pretty cool, even though it was a bit disturbing how much CC seemed to like the woodchipper. Also, #1 reminded him that he told her when she was little that if she were ever going to stuff someone in a woodchipper she should do it feet first so it would hurt longer. He doesn’t remember telling her this and said in his defense that everybody knows if you put body parts in a woodchipper they should be frozen. Anyway, we got most of the trees done. As for the rest on our property, and the other neighbors that they skipped, plus the leaves that they are also not picking up that we’re not allowed to dispose of? I’m thinking bonfire. My driveway. Maybe we’ll get someone’s attention then. Ah, Jersey. Our tax dollars hard at corruption. This was somewhere in the middle of our cleanup and it just kind of made me giggle. 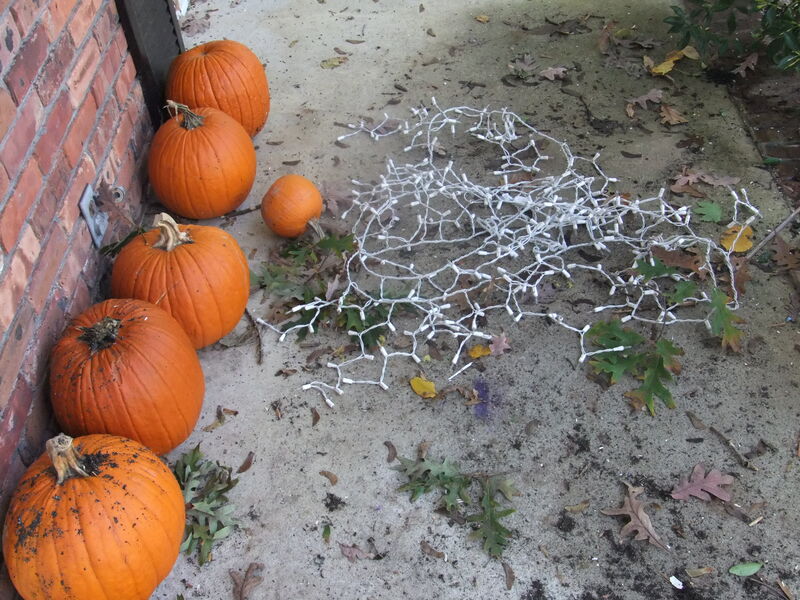 The pumpkins that never got carved but also somehow survived a tree landing on them and knocking them off the porch, coupled with the Christmas lights that we never took down until said tree took down the gutter they were attached to. Thanksgiving tends to get treated as the tiny space in this picture between the pumpkins and the lights, largely because nobody puts up giant inflatable turkey decorations in their yard. Oh wait, they do in my neighborhood. I should take a picture. Hey, speaking of clearing land like a goddamn pioneer woman, here’s one of my dirty secrets. When I need a lift, sometimes I browse the Charlie archives on The Pioneer Woman’s blog. She’s a rancher; he’s a basset hound. Good times. Here’s one: What Is Charlie Thinking? Everything I love about art and the desert in southern California: Salvation Mountain in the Desert on Pretty Girls Make Gravy. What do tubas have to do with zombie burlesque, doom metal, and Genghis Barbie: The leading post post-feminine feminine all-female horn experience? Jacquelyn Adams will fill you in. EC Stilson’s first book, The Golden Sky, came out this week. Anyone who’s had a baby taken from them too soon, or knows someone who does needs to read it. I love how she describes the closure from having written the book in this post: For Zeke on Crazy Life of a Writing Mom. The best post about pedophilia that you didn’t read this week: Chase McFadden’s Why Parents Must Speak of Unspeakable Things on Some Species Eat Their Young. Posted on November 20, 2011 by JM RandolphPosted in One and Done SundayTagged Chase McFadden, cleanup, EC Stilson, JM Randolph, mashup, Pioneer Woman, stepmom blog, storm, Thanksgiving, trees, writing. Next Next post: Ummm. . .
Well for short and sweet you did a terrific job..here’s to you becoming less overwhelmed..and yes I am the same way and tend to get quiet for a bit! The woodchipper was pretty awesome. Now we have a giant pile of woodchips. The picture is great. That’s sort of a Clark Griswoldesque way of getting the lights down. I’d heard of the Pioneer Woman, but never actually been there until now. The mountain of art? Wow. And the piece about the lost child really pulls at you. Thanks for including my post. I’m honored. Sometimes slowing down is the only option we can take. Good for you. Sorry about your tax dollars though – or the lack of appropriate use of them. Make sure you post pics of the bonfire! We have rain now, and I don’t think anything is going to burn. Bummer. During the multiple 1960’s hurricanes here in Miami I would make between $400 and $700 bucks chopping and cleaning up fallen branches and such. Pretty phat coin for a 12 year old kid. Nice! I have to say I’m very surprised that there aren’t kids around here trying to make money off of this. I have seen at least three kids in my own house though watching TV while simultaneously complain about not having any money. I’m glad for the reminder about Chase’s post; Renee asked if I’d read it, and I meant to, but I forgot until now. I’m also glad for your zombie decals. Thank you!!! Oh hooray! I’m glad I finally got them to you! Hopefully that’s cold weather, and not having a cold. Wow, I’m so honored to make the One and Done Sunday list! Sorry to hear about all of your storm related troubles… I’ll bet use of a woodchipper did a lot to physically help process your frustrations though, huh? My pumpkins are missing. No one is fessing up to it, but they’re flat-out gone. The part about the wood chipper cracked me up. We finally took care of the branches in our yard this past weekend! I’m impressed that we lived to tell the tale, since first time usage of a chain saw was involved. Let me know if you set a date for that bonfire yet. Chain saws are badass. CC taught #1 how to use it. I keep waiting for someone’s foot to come off but so far, so good. CC seems to think I will only get arrested if I have a bonfire. I still want to burn my leaves at someone. It’s a powerful tool, let me tell ya. You have to get at least the 6″ diameter one though. Those pumpkins still look mighty good. I’m thinking you should carve up some Thanksgiving pumpkins – why should Halloween have all the fun? I was thinking about that, but they’ve gone missing!